“Detail shots” are one of our favorite types of pictures to take on a couple’s wedding day. If you are a bride or groom based in the Washington, DC area and that is a term you have not heard before, detail photos are the images that your wedding photographer captures of your wedding rings, your engagement rings, your earrings, your wedding dress, your wedding bouquet, the groom’s tuxedo, the groom’s cuff links, the groom’s shoes and any other item of clothing, piece of jewelry or bit of decoration that is personally significant to you or that plays an important role in your marriage celebrations. Those photos are extremely valuable to most brides and grooms, because they are a record the often-overlooked elements that are critical to making their wedding day everything they ever dreamed of. The reason why we like this genre of wedding photography so much is because it allows for so much creativity. We can really push the envelope with the images that we create, and the resulting pictures can look like something out of a dream. Because many of the details (particularly the jewelry) are small, we can position them in places where we could never pose a bride and groom. We can photograph details inside tiny spaces, on top of fences, dipped in water fountains, hung from tree branches or reflected in ice. We can photograph them from unique and unorthodox angles — from straight above, from inches away or from some other direction that we have not even imagined yet! We can take pictures of rings, earrings and wedding dresses lit up with every color of the rainbow. The only limits are our imaginations, which means you, as a bride or groom, get a veritable piece of art when we deliver your wedding photos. 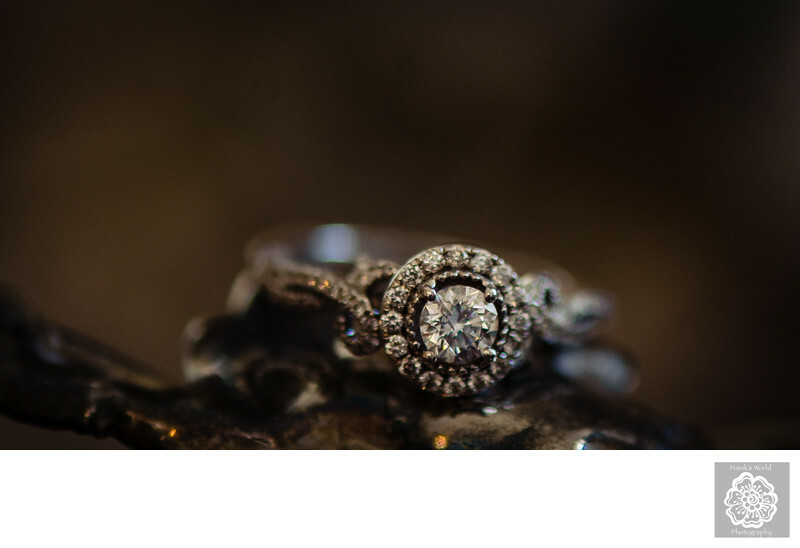 This particular image of an engagement ring was taken at one of our favorite venues for wedding receptions in the Washington, DC metro area: the Metropolitan Club. Located just a few blocks from the White House in downtown Washington, the Metropolitan Club is a swanky and exclusive private club that is an elegant and opulent spot where newlyweds and their wedding guests can celebrate a marriage by dancing the night away. Fiancés looking for a luxurious location for their post-ceremony celebrations should definitely consider booking it! The Metropolitan Club has one thing that sets it apart from other luxury wedding venues in and around Washington, DC, the element that separates every great place for a marriage celebration from the ordinary: superlative customer service. The couple who booked the Metropolitan Club for the nuptials at which we photographed this ring actually had initially planned to have their wedding reception at another venue. Unfortunately, that particular facility ended up not being able to accommodate them and canceled just weeks before their wedding day. Needless to say, the bride and groom were panicking as they tried to come up with a new venue for their reception. When they selected the Metropolitan Club, however, the facility’s first-class immediately put their minds at ease, bending over backward to help them get everything they wanted and have the sort of post-reception party that met all of their expectations. Location: Metropolitan Club, 1700 H St NW, Washington, DC 20006.